Central Jakarta Water Resources (SDA) Sub-dept. is dredging Serdang Raya Connecting (PHB) Channels on Jalan E and Jalan F, RW 10, Cempaka Baru, Kemayoran.
" 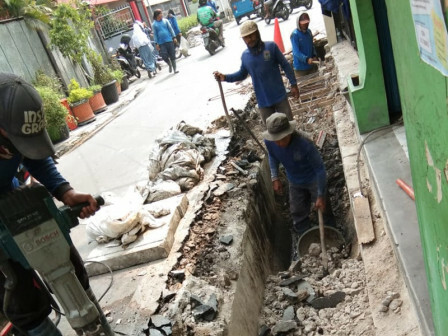 We dredge it because of silting"
"We dredge it because of silting," informed Dicky Suherlan, Head of Central Jakarta SDA Sub-dept., Thursday (7/26). He explained, channel on Jalan E has 240 meters long and 70 centimeters wide. That channel is planned to be dredged to 80 centimeters. While channel on Jalan F will be dredged thus it will have 80 centimeters depth. "We dredge these channels according to resident's request," he stated. Meanwhile, Kemayoran SDA Sub-dept. Unit Head, Yursid Suryanegara added, his side deploys 15 personnel to dredge these two channels. "Our target is to finish dredging in three months," he said .